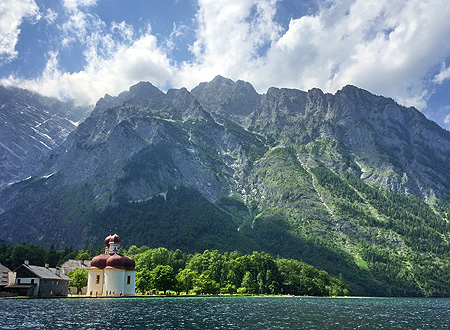 The palace and pilgrimage church were founded by the Prince-Provosts of Berchtesgaden in 1134. The triple-concha design of the church dates back to 1697; the stucco-work is by the Salzburg master Joseph Schmidt. In the 18th century the summer and hunting palace was rebuilt, with older building sections incorporated. After Berchtesgaden became part of Bavaria in 1810, the palace became a hunting lodge for the Bavarian kings and was one of their favourite haunts. Since the Romantic period, the world-famous pilgrimage church, set against the Watzmann range, has been a source of inspiration for numerous landscape painters. The church is suitable for weddings, religious services, prayers (Catholic only) and concerts up to 100 persons. St Bartholomew's Church can be reached via boat from Schönau; the opening hours depend on the timetable of the ferry service. The admission to St Bartholomew's church is free. Please note: The boat trips to St Bartholomew's Church are subject to a fee and not enclosed in the annual season tickets / 14-day tickets of the Bavarian Palace Department.